This being the second iOS game from Mistwalker Corporation, they decided to go a little RTS with it, smart choice. 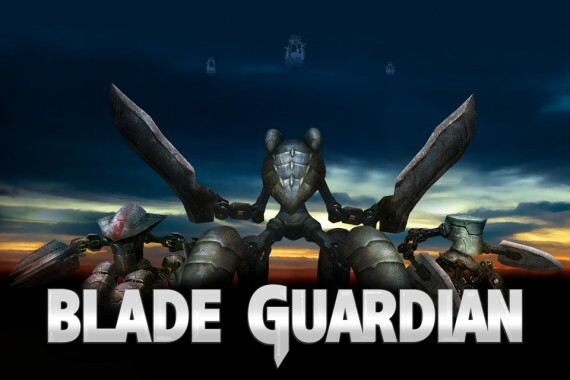 Blade Guardian is a game where you must set up a variety of units, that all have different capabilities, so you can be a hero and stop an alien invasion. 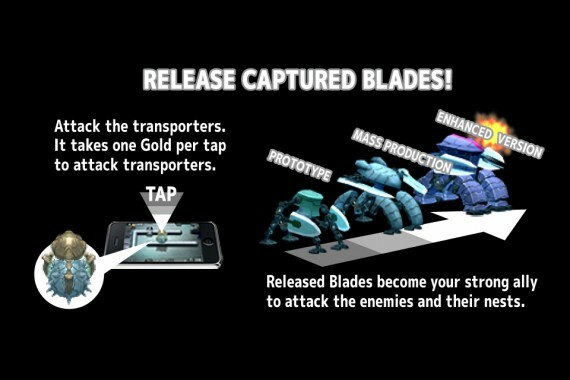 In the game you will take advantage of a special unit called, BLADEs. You release these as they fly onto the screen and then they will do some serious damage. You then have special ones that can transform into the shape of a spear and you can role them around your screen, crushing the alien threat. There is no actual story to the game but there are some objectives you need to complete, defend and destroy. This being an RTS game, there could have been at least a small little scroll through of text every now and then. Now though this maybe the case, they make up for it in the diverseness of levels. 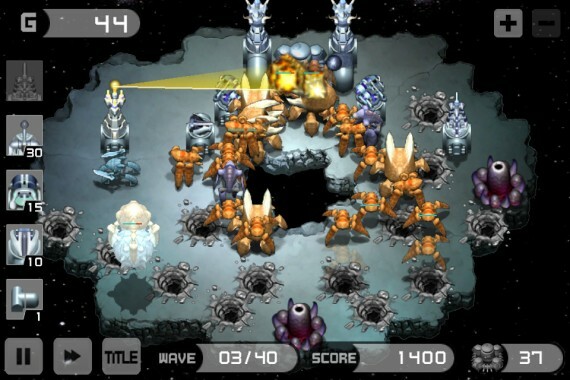 The game brings something many iOS RTS games have tried bringing but, all have failed with. ‘What is it?’ You may be asking yourself. The answer, the actual feeling of an RTS! You have to lay down walls, build mounted weapons on the walls, create wall connectors, and so on. They make this feel right due to the different placements of where you set them on your map. They even give you a limited are to place them in which results in you having to get more crafty and strategic as you make your way through the game. The BLADEs are also what make up a big part of the game. The BLADEs are special units you release these as they fly onto the screen and then release them from their holding so they can do some serious damage. 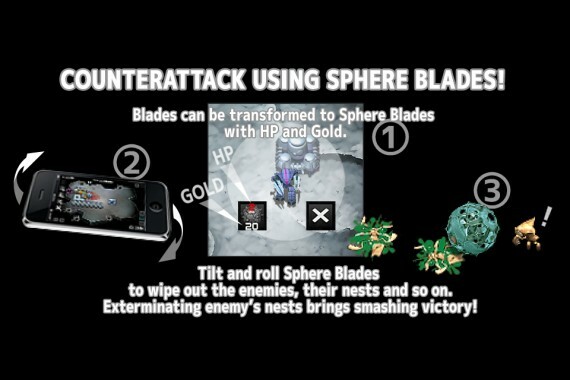 You have a variety of BLADEs at your disposal so you can choose from the sphere blade (which will allow you to tilt and turn your screen to crush the alien threat) to automated ground based blades. Variety, that is one word that describes the levels of the game. You will never play the same level twice which and they all take a different look and shape. I remember how at one point I went from a standard rectangle level, to a level that looked like it was shaped like a heart. This wide difference of levels make me want to keep on coming back to the game. The games graphics are simple and to the point. This is a nice change since most games that are releasing lately are all 3-D and graphically unstable. As I would play through the game, I would notice no lag or glitches whatsoever so I give them props on creating a game that can withstand the limit’s the device has. This is actually my favorite part of the game. When you boot up the game and get to the title screen, you hear one of the greatest themes you will hear in your life time! The theme has a nice mix of science fiction with a little touch of classical. The only thing that saddens me about this is that they do not include it anywhere else but at the games launch title. The sound effects for the game is equally good. I love hearing the sound when I launch a wall or hear my lazer kill another alien. 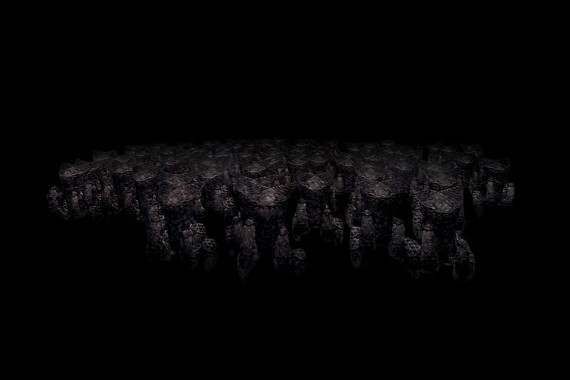 The game also includes a feature of sound that I have never really seen before in any other title, rumble functionality. If you are not able to stop the aliens from getting to the base objective then you will feel a small vibration which will actually come to be felt more and more as the amount of aliens will become more and more after every wave so it will be harder to defend. Mistwalker have created a great RTS game for iOS. Whether you’re a fan of the simple visuals, the thrilling gameplay, or the sound, there is something here for everyone to enjoy. The only thing I wish they would have added into the game though is a story but, it can easily go unnoticed. Now that it has all been said and done, you can go pick up the game right now from the app store for only 99 cents!